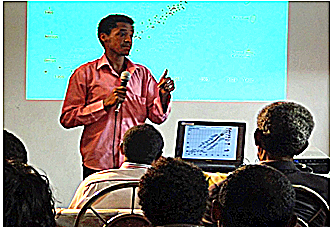 In February of this year, KurzweilAI.net’s Amara Angelica put me in touch with an enterprising young Ethiopian engineer named Getnet Aseffa, who was interested in advanced technologies and their implications, and especially in their potential application to help Ethiopia and other African nations. After some email dialogue, Getnet arranged for me to give a talk via Skype to an audience at Addis Ababa Institute of Technology. The themes of the talk were the Singularity and AGI; it was very well received, with many excellent questions at the end, covering everything from near-term practical AI applications to the potential risks of superhuman AGI. Inspired by the strong reception of my Skype talk, and based on an invitation from Getnet, I recently spent four days in Ethiopia — mostly in the capital, Addis Ababa — with a main mission of better understanding the science and technology scene there, and forming a picture of what sort of AI-related opportunities might be available. I spent some time at the university (Addis Ababa Institute of Technology) and gave a seminar there, and also talked to a host of technologists, entrepreneurs and scientists. Of course, four days is barely enough time to form an initial impression — but I did form a fairly strong one. I came away convinced that there are great opportunities to use AI technology to help Ethiopia confront some of the various problems it faces, and also to collaborate with Ethiopians on pursuing advanced AI R&D, along with other kinds of software and technology development. I have written an H+ Magazine article giving a more personal account of the visit and some of the interesting conversations I had. Here I will take a broader view, and synthesize some of my impressions and opinions on the potential near and medium term future of AI in Ethiopia. Before connecting with Getnet last year, my main impressions of Ethiopia had to to with famine and the Ethiopia/Eritrea war. But of course these tragic events are history now, and Ethiopia is the third fastest growing country in the world, and the fastest growing African nation. The majority of Ethiopians are still rural farmers, and poverty, unemployment and income inequality are all high. However, starvation is a thing of the past, and disease is being controlled by an increasingly sophisticated medical system. Education is now widespread, with 95% graduating primary school, 60-70% graduating high school, and the number of universities pushing 100. There is a highly energetic and rapidly increasing population of businesspeople, entrepreneurs and technologists, explicitly striving to better their country and maintain its fantastic growth rate by starting and executing a huge variety of projects. There’s also a significant foreign presence, especially Indian, Chinese and Korean. The government has explicitly looked to Korea as a guide for rapid, carefully state-managed development. At first glance, the idea of doing AI in a developing country like Ethiopia may seem a non sequitur. One might think that developing countries have a lot of other more basic problems to deal with, before they need to start thinking about advanced technologies like artificial intelligence. But actually, this is an overly limited perspective. Many decision-makers in Ethiopia and other developing countries recognize the existence of opportunities to leapfrog past stages of development that currently developed countries have passed through, using new technologies to hop directly into the future. The most notable example of this is the tendency of developing nations to bypass the widespread laying of communication cables in rural regions, relying on wireless instead. Similarly, even though currently developed countries didn’t have much to do with AI during their earlier stages of development, different opportunities may exist for developing countries today. In fact, I believe there are great opportunities for AI to help developing countries such as Ethiopia, and for these countries to help advance AI. And not only do such opportunities exist, but there is real appetite in Ethiopia (and quite likely other developing nations as well) for exploring them. Getnet has been organizing advanced technology seminars in Addis Ababa every couple months, with 700+ attendees each time, coming to hear about topics like AI, the Singularity, nanotech and self-driving cars. AI-based modeling, prediction & decision support for economic growth. This would require the creation of a comprehensive database of information regarding the Ethiopian economy — which would be a good thing in itself. Exploring this possibility in depth turned up various subsidiary problems, such as the fact that much of the needed data exists only in Amharic textual format, and no available solution for Amharic OCR exists. AI-controlled microdrones — these are already in use for surveillance purposes, but supplying them with better machine vision could allow them to be used more broadly, e.g., to survey crops and track the spread of agricultural disease. Similar technology could enable microdrones to be used to help with mining prospecting. AI tutors, provided via smartphone, could enhance the education system. The reason why 30% or more primary school graduates don’t attend high school is mainly transportation. If there’s no high school in your village, it may be a very long commute to and fro to high school, which is especially problematic if your help is needed around the house and farm. Tele-education may be part of the solution. Smartphone-based medical diagnostics. With a microscope attachment, a smartphone can analyze blood samples and message the pictures to servers where AIs or human doctors can analyze them. A host of other portable, automated diagnostic possibilities exist — this is related to the current Tricorder X-Prize. My seminar at the university overall was 2.5 hours in length, covering a variety of topics including Singularity, AGI, AI-based bioinformatics, life extension and machine learning. The academic, programming and engineering expertise exists in Ethiopia, right now, to carry out nearly all of these things. Furthermore, the government has sufficient funds and motivation to pursue these sorts of projects. A number of government officials attended my seminar, and some asked probing questions. What seems to be lacking at the moment is any organization oriented toward carrying out these sorts of applications. 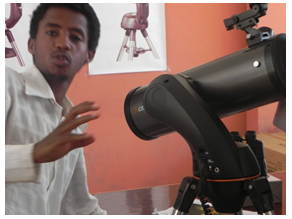 Perhaps in time, Addis Ababa University will formalize an organization similar to MIT Media Lab, bringing together scientists and engineers with various backgrounds to creatively address Ethiopia’s issues and opportunities using AI and other advanced technologies. Contemporary Addis Ababa gives one the feeling of immense energy and enthusiasm — much of which is untapped. In spite of the rapid growth, unemployment remains high, even among the college educated. I was amazed to find that fully competent computer programmers, with knowledge of languages like C++ and Java as well as the theory of algorithms and data structures and so forth, are generally paid around US$100/month. Even experienced experts may earn only double that. The cost of living in Ethiopia is also quite low by international standards, with reasonable-quality apartments available for $90/month and others as inexpensive as $20/month (though one can also pay $2000/month or more for a large and luxurious accommodation). But from a business perspective, this seems to pose an interesting opportunity. The Ethiopian infrastructure is still at an early stage of development, but for some industries, this doesn’t matter that much. Software is a good example. The average Internet bandwidth in Ethiopia is distressingly low, but for a relatively modest price one can get a decent connection (say, hundreds of U.S. dollars per month). And the bandwidth situation is rapidly improving. Computer hardware and repair are readily available. There’s no fundamental reason that I can see why Ethiopia shouldn’t have a booming software outsourcing industry. The cost of outsourcing to traditional locations like India, China and Eastern Europe is rapidly increasing, causing outsources to look to other locations such as Vietnam. But the prices Ethiopia offers are hard to match. I’m speaking about Ethiopia in this context because it’s the place I happen to have made contacts and gained knowledge — but it’s highly possible that some other African countries may offer similar opportunities. One thing that may make Ethiopia especially appropriate, however, is its relatively high-quality education system. Programming and algorithms are about the same anywhere. Where technical matters are concerned, the students and faculty I met at Addis Ababa University might just as well have been at any engineering school in the developed world. Of all the advanced technologies pushing directly toward Singularity, AI distinguishes itself by requiring the least resources. Nanotech, robotics and biotech require expensive lab equipment, which is difficult to maintain appropriately in a location like Ethiopia, where spare parts are far away. But AI just requires computers and smart programmers, and an Internet connection. Ethiopia has all of those, and at a remarkably low price. So it seems quite possible that Ethiopia, and other developing countries, could end up serving as the engines of AI advancement — maybe even the location of the breakthrough from narrow AI to Artificial General Intelligence. Actually, I’m not sure the breakthrough to AGI will occur in any one place — if it’s the OpenCog project I co-founded that makes the breakthrough, then it will occur in a globally distributed manner, since OpenCog developers are working on multiple continents round the clock. But there’s no reason a major contribution to such an effort can’t be made by teams in developing countries, taking advantage of the unique opportunities offered by their developmental stage. This is a possibility I’ll be actively exploring via ongoing conversations with my Ethiopian colleagues.